The best kitchen decor is the kind that comes with a story. It serves a purpose in your kitchen and is a great conversation piece. I found the perfect gadget holder one day when I pulled up at a vintage shop. One of the vendors had pulled out several old vintage items from her trunk to show the shop owner. While the owner was making her decision on which things she wanted to keep for the shop, I studied two chair springs. Thinking that I could make use of them somehow in my kitchen or upcycle them to sell, I knew I just had to have them. When I purchased the springs, my first thought was to make utensil holders. Several months went by. 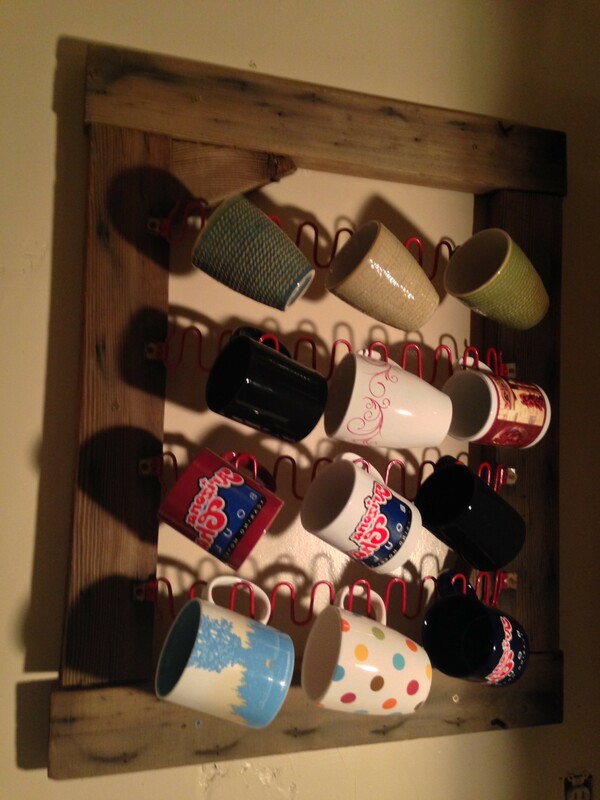 Then my daughter showed me a picture of a board she found at a second-hand store that she made into a cup holder. I showed my husband, and we both agreed that the larger of our two chair springs would make a great cup holder. My husband painted the wire part a dark red to match the red accents in our kitchen. Now we have a nice display for part of our cup collection. I love your cup holder. You and your hubby are so creative. Isn’t it the coolest thing? Actually, I give credit to our youngest daughter for the cup holder idea. She had upcycled a piece into a cup holder, and the hubs suggested we make our chair spring into one. I love it!